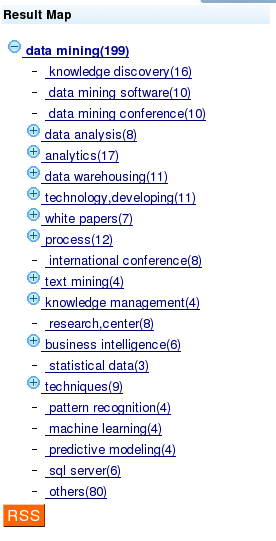 Attenex, a company specialising in data/text mining, has what appears to be a slick document clustering/visualization product. I haven't found any clean screen shots, but the one below gives you some idea of what they produce. Their product pages also show some standard, but well presented, components that deliver key words and phrases. A while back, I wrote about how dangerous trend mining over blogs could be in the wrong hands. Stephen Baker writes something similar in a recent post, but he gets the message completely wrong. Stating that blog analytics are weak is not helping anyone. All that is being said in the post is that keywords offer no insight to or protection against the inherent ambiguity of words. Consumer facing search engines treat documents as objective, surface form data: sequences of characters forming words and phrases. Ambiguity is observed when the intent to express two different meanings results in the same sequence of characters being used. Or, to put it the other way around, a word has two meanings. Something is going on with Vivisimo. First there was the Murdoch rumour, then I hear them interviewed on NPR (in a story relating to immigration), now I see this paper by Raul (via Battelle). The paper makes a good argument for why personalized search won't happen for underlying technological reasons. I have to say, I find myself agreeing with Raul's point to some extent. I would add that personalization is another example of making the computer smarter (while preserving the sacred simplistic interface) rather than empowering the user. Vivisimo's clustering engine is a great example of extending the interface: giving the user more control and more information. I put the question: why haven't other search engines gone for this? on the same stack as: why can't we browse news by maps?